Face-to-face meetings are what counts: Is the trade fair obsolete? Is the trade fair obsolete? Are trade fairs still relevant? Just few clicks on the internet result in abundant information – information that is cheap, comprehensive and instant. This often includes contact information on relevant players. However, Adlershof-based companies and institutes still present themselves at trade fairs – and do not want to do without them. On the wall, a picture shows the vastness of space. Against the backdrop of a multitude of stars, a person in a white spacesuit is working in mid-air. Sitting in front of this picture, a zero-gravity proof 3D printer is humming, a technology that makes it possible to create on-demand replacement parts and tools in space. This setup was the highlight of the booth which the BAM Federal Institute for Materials Research and Testing used at Hannover-Messe this year. Space is the perfect backdrop to highlight BAM’s mission: “Security in Technology and Chemistry”. Other highlights of the BAM booth included organic concrete made from renewable resources and novel fertilisers produced through phosphorous recovery of sewage sludge. “We are a research institution and we wanted to show an international audience: we are part of the Made-in-Germany DNA,” says Venio Quincque, head of corporate communications at BAM. 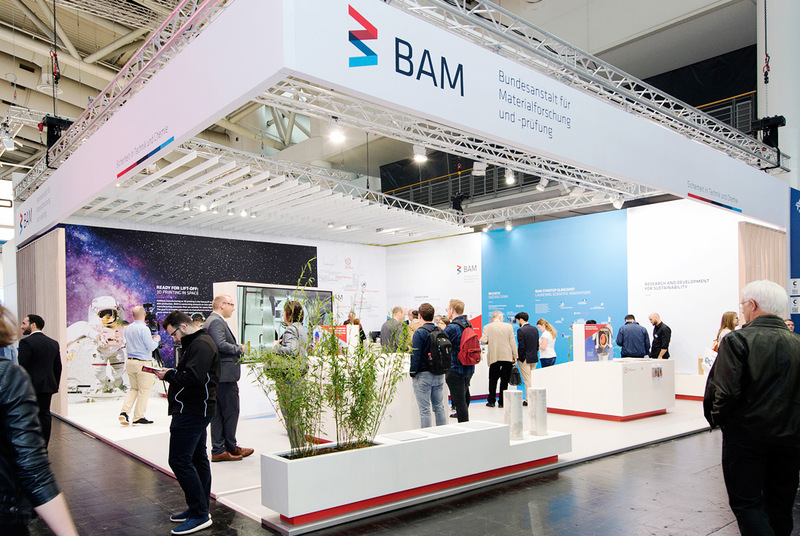 The goal of visiting trade fairs is to strengthen the BAM brand as well as cultivating and expanding its network. This also has its perks: you meet people you did not expect to meet. This time, for example, the company got to know a young architecture company searching for new materials, who were fascinated by the organic concrete components made of manioc, rice hulls and coconut fibres. Digital media creates new opportunities, which can also be used in trade fair booths, including films, presentation, and animations. However, classic exhibits are indispensable. They make showcasing processes and products easy and create haptic experiences – which is something the internet just cannot do. In the past, trade fairs served traders to present their merchandise to the public. Today, business-to-business communication, or B2B, is more important. This is one of the reasons why many sectors now follow the concept of creating spaces for communicating instead of piling up merchandise, says Karl Michael Casper of Runze & Casper. The Berlin-based agency designs trade fair booths for real-estate shows in Cannes (MIPIM) and Munich (Exporeal) for customers from Berlin and Brandenburg, including Adlershof. This is the key business of Runze & Casper. Real-estate trade fairs are ideal places to bring together the diverse market players of that sector – which can include banks, project developers, real-estate providers, transactional lawyers and policy-makers. Casper sketches out the special challenges: “The booth has to create spaces for presentation and ad-hoc meetings. People in real estate are brutally calculating. They don’t spend money on something, they don’t think is worth it.” Attendance across the important real-estate trade shows is up. It appears that, in the era of digital communication, meeting face-to-face is more important than ever no matter which industry.